Lumberjack is the outstanding 4 Elixir Legendary card which is unlocked from Arena 8 (Frozen Peak). His attack speed is incredibly fast (0.7s per hit). He targets singly ground unit only. Upon death, he drops a bottle of Rage offering the Rage effect for all troops nearby. The Lumberjack is excellent in so many situations. A lone Lumberjack can deal an impressive amount of damage. 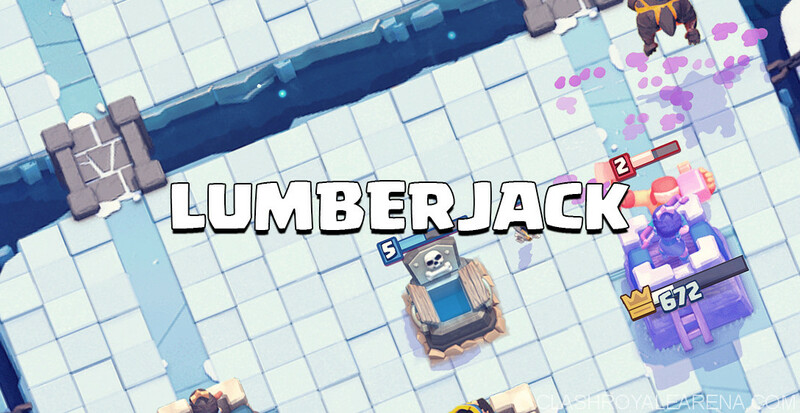 Place him behind a tank, the tank will soak all damage while the Lumberjack is dealing tons of damage. With his insane attack speed, he can easily take out defending units and shred any defensive tower. Place him in front of a push If you want to make the use of his Rage effect early (when coupled with Balloon etc). Lumberjack + Fire Spirits is my favorite small push. 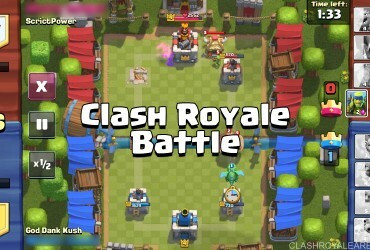 Place the Lumberjack in front of the Fire Spirits to soak damage and Fire Spirits will take out any defensive squishy defensive troops used to distract the LJ. 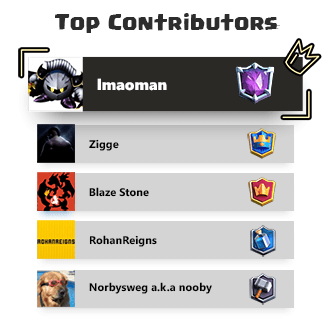 I have seem some impressive decks with the Lumberjack involve tanks such as Golem, Giant and Lava Hound. The tank should be placed at the back to allow you to build up Elixir for the big push. Place splash damage troops behind the tank (Witch, Wizard, Bomber…) after that. When the tanker is about to cross the river, place the Lumberjack either in front of or behind the tank. If you use him in front of the tank, he will die early and rage your push. If you place him behind the push, he can help you deal with defensive units. Golem + Lumberjack + 3 Musketeer is an insane combo you can easily face these days in the Challenge mode. Lava Hound + Lumberjack and Giant + Lumberjack another great combo. 24/8/16, changed the Lumberjack’s speed from fast to very fast, increased his hit speed from 1.1 seconds to 0.7 seconds and decreased his damage by 23%. 19/9/16, decreased the Rage’s attack speed boost to 30% (from 40%) and its duration by 2 sec. This also affected the Lumberjack’s Rage. 1/11/16, increased the Rage’s attack speed boost to 35% (from 30%). 15/12/16, increased the Lumberjack’s hitpoints by 6%. 13/3/17, increased the Rage’s level such that it is now 3 levels higher than the Lumberjack (a level 1 Lumberjack will drop a level 4 Rage). 19/4/17, increased the Lumberjack’s hitpoints by 4%. 24/1/18, increased the Lumberjack´s hitpoints by 7%. Pretty like the Mini P.E.K.K.A, our Lumberjack is excellent at dealing with tanky units. 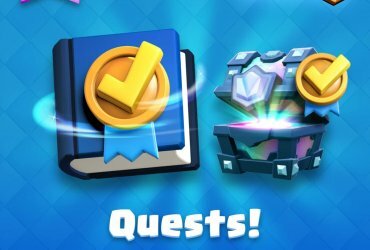 High damage units such as Mini P.E.K.K.A, Prince, P.E.K.K.A… and tanky units such as Giant, Giant Skeleton, Valyrie… can easily counter the Lumberjack (assuming that Lumberjack is on the opponent’s side). They can either kill or help the Tower kill the Lumberjack before he makes it to the Tower. Also, even LJ attack speed is very fast, swarms can easily take him down (Skeleton Army, Barbarians, Goblins…). Air troops can also kill the LJ before he touches the Tower. So, If LJ js your main damage dealer, try to couple him with splash damage troops in your push. Don’t hesitate to zap your opponent’s defensive troops If you can 1 hit them (unless your opponent has Sparky). Have your Zap ready, hover it on the opponent’s Arena so you can easily release your finger and use it immediately. As mentioned above, Lumberjack + Fire Spirits is my favorite combo. Builders are the harder counters to Lumberjack. You will need to use a tanky units in front of the LJ to help him survive. Giant and Hog rider work great at this since they are building targeting units. The Lumberjack is not only good on offense but also on defense. Indeed, he is such a beast on defense. Place him at the middle to lure and kill the Mini P.E.K.K.A. Lumberjack is also pretty good at dealing with Hog Rider but the Hog still can hit the Tower 1-2 times. You can also use him to deal with Miner although It’s an negative Elixir trade. Or, you can take some hits from the Miner to have a full HP Lumberjack. At level 1, Lumberjack deals 285 damage per second. I really like using Lumberjack to stop tankers. For example, when the Giant is placed, I drop the Cannon down and use Lumberjack to take it down faster. If your opponent uses Giant Sparky combo, use Cannon to pull the Giant, zap the Sparky then drop your LJ right on top of the Sparky. Defensive LJ can help you launch an epic counterpush right after that. If you want to deal with the Bowler, drop a tanky unit on one side and drop you LJ on the other side to quickly take out the Bowler. If there is a Musketeer, drop the LJ right on top of it. LJ will take out the Musketeer before she can hit him the second time. The Lumberjack is a beast on both offense and defense. With the impressive DPS and movement speed, he can take out so many troops. He can be used to spill the rage everywhere or for his damage. His damage can be used to take out tower or to stop pushes. Although he has a few weakness when it comes to air troops and buildings, he is still a great card. 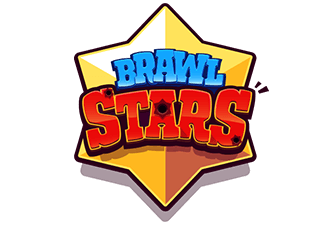 Since this guide is still being updated, don’t hesitate to comment to share your opinions guys!